There are two kinds of hummingbird feeders – reservoir styles with the nectar suspended above the feeding ports, and saucer styles that are covered dishes holding nectar. Either is suitable for hummingbirds, and the best option is to use both. Different hummingbirds have different feeding preferences, and if they don't care for one feeder, they may be willing to visit another. At the same time, offer some feeders that have perches and some that do not to accommodate all types of hummingbirds. Hummingbirds can be aggressive, and one dominant bird may be chasing away many other hummingbirds before they get a chance to visit the feeder. Putting out several hummingbird feeders offers more places for these birds to feed, especially if the feeders are around the corner or otherwise out of sight from one another so one bird is less able to guard the entire yard. Hummingbirds are attracted to the color red and similar shades such as pink and orange, and while all good hummingbird feeders have some amount of red in their construction, it doesn't hurt to add more. Place a red gazing ball or pot of red flowers nearby, or decorate the feeder pole with red ribbons or paint to give it an extra touch that will get hummingbirds' attention. It is not necessary to add red dye to the hummingbird nectar, however, as large amounts of dye may be toxic to hummingbirds. Just add red color nearby instead, and the birds will soon discover the feeder. While hummingbirds will happily sip at feeders, they will be even happier in a backyard with plenty of natural foods to sample. 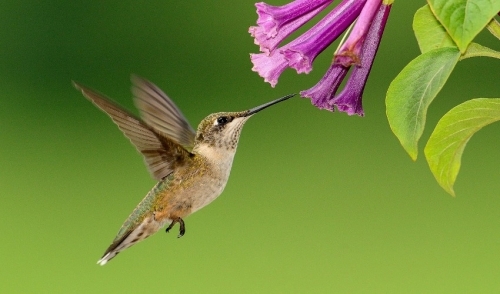 Plant a variety of nectar-rich flowers such as bee balm, columbine, cardinal flower, trumpet vines and petunias, and minimize insecticide use – hummingbirds eat many small insects, gnats and spiders for the necessary protein in their diet. The more food there is in your yard, the more hummingbirds will visit, and they will all regularly drink from the feeders as well. Hummingbirds can be territorial, and they like to have a nearby perch to rest between sips and to keep a wary eye out for intruders. Providing dense shrubs that aren't pruned to perfection is a great way to offer perches, or hummingbirds will also perch on clotheslines, wires, vines or sweet little hummingbird swings made from wires or slender wood. Perches that are out in the open and offer good fields of view will be most attractive to protective hummingbirds. Nectar can quickly spoil on hot summer days, and if your nectar has gone cloudy or shows a filmy substance or black specks inside the feeder, it is time for a thorough cleaning. Discard the old nectar and scrub the feeder, including the feeding ports and perches, thoroughly in a weak bleach solution. Rinse it well and allow it to dry before reassembling the feeder and refilling it with fresh nectar. A clean feeder will be more attractive to hummingbirds and minimizes the risk of spreading bacteria or mold that can be harmful to the birds. It may take time to attract hummingbirds to your feeders, but these are loyal birds and once they recognize your yard as a safe, reliable source of food, they will return again and again. Within a few years, you'll have an entire flock of glittering hummingbirds eager to take advantage of your feeders.